Hidden, from Flipcode, is a comprehensive and easy-to-use Mac theft recovery service, which the company claims as the cheapest and most advanced theft tracking solution for your iMac or MacBook. As what its name implied, the Hidden app is working invisibly on your Mac system until your computer is lost. Hidden Mac theft tracking service normally costs $20 for purchase. 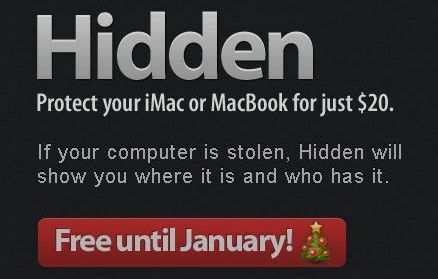 As a Hidden’s Christmas giveaway offer, the interested Mac owners are now entitled to get the Hidden theft tracking solution for free. This time-limited Christmas giveaway promotion will be expired on January 1, 2011.